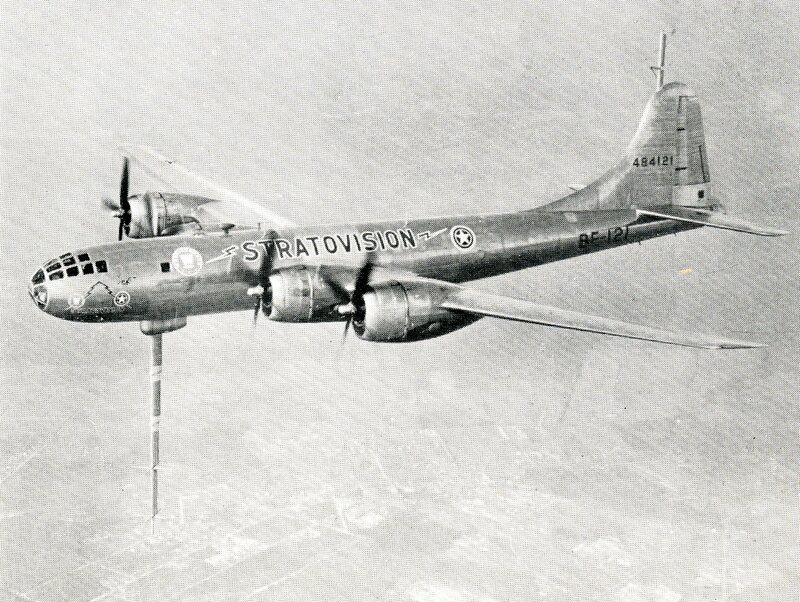 A modified Boeing B-29 Superfortress heavy bomber used for the 1948-49 Stratovision television broadcasting trials. Anon., “Airborne telecasting proves successful.” Aero Digest, August 1948, 32. For my next trick, yours truly shall require your full attention, my reading friend. Your mission, should you accept it, is to make a leap of faith, across the chasm of time and space, from 2018 to 1948. And yes, the photo above shows an airplane. Any thoughts? Have you ever heard of MPATI or Stratovision? No? That’s quite all right, I forgive you. Besides, yours truly had no clue either until he stumbled across the photo above, in the American monthly magazine Aero Digest. Our story began in the United States around 1944-45, when Charles Edward “Chili” Nobles, a radar engineer working for Westinghouse Electric Corporation discovered that a television signal broadcasted from an airplane in flight could be detected at a great distance – up to 340 kilometres (210 miles) rather than 80 or so kilometres (50 miles) as was the case for a ground-based transmitter. Using a number of flying television stations located strategically would be even better. Why is that so, you ask, my puzzled reading friend? Early television broadcasts had a limited range, the aforementioned 80 kilometres (50 miles). The very curvature of the Earth was the problem, as television signals travel in a straight line. If a receiving station was too far from a broadcasting / transmitting station, beyond its horizon, it could not “see” the signal and no television magic took place. And yes, Westinghouse Electric was mentioned in a July 2018 issue of our blog / bulletin / thingee. Would you believe that an airborne transmitter needed only 2% of the power required by a typical ground-based transmitter? Better yet, the interference and distortion inherent in the use of a ground based broadcasting system was all but eliminated, in theory. Nobles and his colleagues calculated that 14 airplanes able to relay programs between themselves would serve 78% of the population of the United States. Adding another 6 airplanes would bring coverage to all 48 states of the union. And yes, there were only 48 states in the United States back then. In either case, each broadcasting airplane would have a backup in the air nearby, ready to take over. In turn, these 2 airplanes would be backed up by 2 more on the ground undergoing maintenance and / or repair. The envisioned network could therefore require a fleet of up to 40 specially equipped airplanes. Nobles’ noble idea was called Stratovision. Westinghouse Electric developed the concept in cooperation with a well known American aircraft maker, Glenn L. Martin Company. The latter actually designed a Stratovision version of its brand new airliner, the twin engined medium range Model 2-0-2. This pressurised airplane, possibly an equivalent to the Model 4-0-4, was not put in production. If truth be told, the Model 2-0-2 did not sell all that well. The Model 4-0-4 itself did not do much better. The family of airplanes launched around the same time by Consolidated Vultee Aircraft Corporation, a company later known as the Convair Division of General Dynamics Corporation, was far more successful. And yes, my reading friend fascinated by flight, there is a very important representative of that family in the wonderful collection of the Canada Aviation and Space Museum, in Ottawa, Ontario, but back to our story. As one might expect, the ever present bean counters liked Stratovision because it might / could / would make television and FM radio broadcasting profitable in the blink of an eye. You see, a network of flying television stations would be significantly cheaper to build, operate and maintain that networks of underground coaxial cables or ground based relay towers located throughout the United States, these being the 2 methods used back then to distribute television programs. A journalist or promoter was so impressed by Stratovision’s revolutionary potential that he called it the atomic bomb of broadcasting – a rather inappropriate expression if I may say so. One could argue that the SHARP unpiloted aerial vehicle mentioned in a January 2018 issues of our blog / bulletin / thingee was designed in Canada for a similar purpose, more than 35 years after Stratovision and more than 35 years ago. And that, my patriotic reading friend, was your Canadian content for the week, besides my annoying tendency to mention the Canada Aviation and Space Museum, where I earn the money that keeps a roof over my follically challenged head. In any event, Westinghouse Electric tested the Stratovision concept on a couple of airplanes, modified Boeing B-29 Superfortresses heavy bombers of the United States Air Force from the looks of it, between the middle of 1948 and early 1949. By and large, the trials proved rather successful. One of the 2 events broadcasted, at least in part, in June 1948, was the Republican Party’s national convention. Some might argue that the other event, a rematch for the heavy weight boxing championship fight between Joseph Louis “Joe Louis” Barrow, also known as the “Brown Bomber,” and Arnold Raymond Cream, oddly known as “Jersey Joe Walcott,” proved even more popular, but I digress. Incidentally, “Joe Louis” won. The area covered by these 1948 broadcasts was ginormous. If truth be told, it was slightly larger than France. And yes, the Superfortress was mentioned in February 2018 issues of our blog / bulletin / thingee. Very pleased with the results of the trials, Westinghouse Radio Stations Incorporated, a subsidiary of Westinghouse Electric, contacted the Federal Communications Commission (FCC), the organisation that supervised broadcasting in the United States, to gain permission to operate a Stratovision station. Sadly, the FCC enacted a moratorium on the creation of new television stations in 1948. The Stratovision project was shelved. The FCC ended its freeze in 1952. Around that time, it indicated that, in large metropolitan areas, some channels would be set aside for non-commercial educational use. The first of these, WTTW Channel 11, hit the airwaves in September 1955, in Chicago, Illinois. Teachers whose schools were located within the range of the station were very pleased. Their colleagues living elsewhere in the country were duly intrigued. The truth is, they wanted to bring to their pupils the benefits of televised content. Sadly, few of them believed that a national network of educational television stations would be set up anytime soon. And there things stood until 1958. That year, Westinghouse Electric approached the Ford Foundation with an intriguing idea. No, not that Ford, the other Ford. No, not Harrison Ford, the other Ford, the son of Henry Ford, Edsel Bryant Ford. Jeez, concentrate, my reading friend. There will be a test. This intriguing idea was, you guessed it, an updated version of Stratovision. Providing a quality education to the rapidly increasing number of students enrolled in American schools was not easy. It was, however, a priority. The launch of Sputnik I, the world’s first artificial satellite, by the Union of Soviet Socialist Republics, in October 1957, had been a nasty shock. The rocket used to launch this fellow traveller seemed, after all, capable of lobbing a (thermo)nuclear bomb all the way to North America. And yes, my reading friend, Sputnik I was mentioned in a July issue of our blog / bulletin / thingee. The space race was about to begin and concerns were expressed that the United States was / were falling behind, both technologically and educationally. A collective effort was required on all fronts, which sounded a lot like Socialism / Communism when you got down to it, but I digress. Airborne television could help make the United States great again, at a fairly low cost. The Ford Foundation was impressed and agreed to fund part of the first year of a 3 year experimental broadcast program. It later agreed to partly fund the second year. The Midwest Program on Airborne Television Instruction (MPATI), a regional rather than local or state-based project, came into existence in 1959. Based at Purdue University, this not for profit organization brought together a number of television producers and educational institutions, including some universities. Development of a primary and secondary school curriculum, not to mention material for college students, began in earnest. Subjects included algebra, arithmetic, biology, English, French, geography, history, literature, music, finger painting, Spanish, etc. The 16 to 20 teachers who would present the material were chosen via a country wide search conducted with the help of several teaching universities. The classes were filmed in one or more studios and put on videotape. Live telecasts were also envisioned but could not be arranged in the end. The presence of mathematics in the curriculum is worthy of note. Would you believe that MPATI was soon nicknamed “Pi in the Sky?” The question, of course, is whether or not the smarty-pants who came up with that pun had mathematics in mind. They may also have thought that MPATI was a pie in the sky. And yes, my fond of trivia reading friend, the title of an October 2017 issue of our blog / bulletin / thingee did include a pun made with the word pi. Was MPATI a success? Did it expand beyond the borders of the United States? Come back next week for an answer to these exciting questions – and for the test.